For a free urban celebration of canoeing and kayaking with a token registration fee for on-water courses, demonstrations - and back at the beach seminars, the third annual Victoria Paddlefest hosted by MEC looked to be another success. 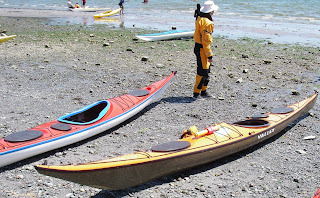 Being a three-decade Valley Canoe Products paddler myself I was pleasantly surprised to see the newer named, Valley Sea Kayaks well represented at Gyro Park now that Ocean River Sports in Victoria carries the Valley brand. Furthermore, Rob Avery was present with some extra Valley kayaks, including Sean Morely’s Nordkapp he’d used for the Vancouver Island Circumnavigation, as well as the nicely updated Valley Anas Acuta that all testers agreed was the most fun kayak of the bunch. It would have been nice if there was the 18’ Valley Q-boat there too. I was able to test paddle the Nordkapp LV at my new weight of 215 pounds. I’d tried it previously at 170 pounds when the Tidrace kayaks were given a spin out at Trial Island. Both Gordin and I had agreed it was a fine sea kayak though it retained that classic Nordkapp tenderness you either love or hate. I was just able to squeeze into the cockpit and put it through a few manoeuvres. There was a bit of wind and the LV weather cocked far less than the classic Nordy, but it benefited by use of the skeg early. Other kayaks I know take longer before the benefit is essential. What I did find invaluable this year was the opportunity to discuss kayaks with the very knowledgeable Rob Avery, who is the new Valley sales rep for the west coast region. Sean Morely has moved on to represent P&H and Pyranna kayaks. Rob, based out of Bainbridge, Washington kayakcraft is a BCU Level 3 Sea Kayak Coach and ACA Open Water Instructor. He’s an unassuming fellow, all around grand chap, and now deep in the Valley. With the Nordkapp LV on my short list, there were some questions I was seeking answers to. There has been a fair bit of feedback from paddlers all over that the new LV unfortunately retained the high back deck. The answer I was given? Lay back rolls are dangerous you know. The kayak was designed as an easier to control unladen version of its bigger brother, the full sized Nordkapp, for smaller paddlers or paddlers looking for performance without the payload. There are no plans to address this rear cockpit height issue as far as Rob knew. Second point: is there any discussion at Valley regarding front day lockers, such as found on the Rockpools and the new P&H Cetus? No. Is there a possibility to custom order an LV cut down (the seam line is lowered before joining the hull to deck yielding an even lower volume kayak). Given the curves near the seam line it would be highly unlikely. I asked Rob about some of the rumours about quality control issues at Valley again. He wasn’t aware of any but did admit one boat shop on mainland BC had an out-of-proportion number of skeg issues than anywhere else, which seemed an odd anomaly to him. Rob did agree that the choice to go with a round bilge hull with its responsiveness to hip movement versus a soft chine hull with better feedback for carving was an intensely personal preference. Furthermore, the Nordkapp series are kayaks you grow with for many years but are kayaks that have years of rewarding performance. Certainly the Nordkapp LV does provide good manoeuvrability though its static stability at rest remains low. There was a paddler present with his Tiderace Xcite. Like the SKUK kayaks, it was heavy and well built – really stiff, strong, and durable. The owner loved the cockpit ergonomics, seat, knee position and height/angle of the front cockpit. He said if he could get his Nordkapp LV with the same deck, cockpit and seat as his Tidrace, he’d be in the Valley way more. I should add that from what I could see, the Valley Avocets looked like they are really worthwhile designs for a shorter boat. Rob felt the Avocet LV would be a far more suitable choice for a small or lightweight female paddler allowing them positive control of the kayak as well as the ability to keep up with the group. He'd rather see these paddlers in an Avocet than a Romany, though he felt the Romany (and Explorers) were fantastic boats for the correct paddler and as generally good at everything kayaks, much like the Aquanaut (which I feel lost in). I should also mention that as far as I am concerned, all the Nordkapp models have a tendency to weathercock, ergo my addition of a deep draft rudder to my HS three decades ago. Where the Nordkapp LV differs is it is easily edged and is relatively stable on edge for correcting weather helm - something more difficult to do with the older Nordys. With the better cockpit ergonomics such as found in the Rockpool and Tiderace decks, knee drop/knee raise would yield much more positive results for edging in earnest for long passages in quartering seas. My short test of the LV was done keeping the hull level so as to assertain the tendency. Needless to say, you can see the relavence of that Tiderace paddler's perspective of wishing his Nordkapp LV had the Xcite's ergonomics. All kayaks start to get a bit unruly after 30 knots and I suspect the Nordkapp LV in the hands of a skilled paddler probably resists the alternate issue of lee cocking once you hit Force 6 to 8 that some of the other heavy weather favourites may or may not suffer. I have yet to test this theory subject to a more in depth test of the LV that will surely come. I'd also like to know why Sean Morely's feet got so beat up downwind in Juan De Fuca in heavy following seas. Were there broaching issues with the standard Nordkapp? As much as I hate weathercocking I'm not sure how irritating leecocking is. To my mind this might be dangerous. The Nordkapp HM can be a bear to turn into the wind with its built in skeg. I've heard the Mariner kayaks suffer a bit from leecocking. I'd have to test this myself, but as a high-wind seeker, I'm not rushing out to get a used Mariner just yet (reportedly Mariner's are generally used completely skeg-free - a worthwhile endeavour; however, it appears the NDK/SKUK are the main ones used by skegless expeditioners such as Duff, et al). I'd be better off with a used NDK I suspect for a neutral handing kayak. Not sure. By the way, Valley doesn't offer the Ultra carbon infusion on their decks any more due to expense - only the hull. Decks are hand laid. Chris Mitchell in Bellingham can do his Rockpool kayaks with infusion layup in both the hull and deck with superior resins as well as offer custom deck fitting arrangements - much like Valley did in earlier days. I'll probably give the new Rockpool GT a demo when he has one avaliable. Unlike the Romany and Explorer, the Rockpool kayaks carry the hull width to a better transition to their fine entry line causing less of a bow wave. But at what cost to other handling characteristics? The ability to play in rough water might not be as important as control in big seas and wild winds for the expedition paddler or those seeking really big conditions. The Romany and Explorer have proven track records and the Nordkapp LV is garnering increasing praise in this regard. "Lay back rolls are dangerous you know." That answer you got is completely unsatisfactory to me and it doesn't make much sense to me. That sounds like ignorant regurgitation of something that a coach may have taught him in the past rather than reality. The reality is that if you get knocked back when your flip, roll to the aft deck, if you get knocked forward, roll to the foredeck, and if you get knocked sideways, roll upright. Setting up in water is oftentimes the dangerous part since your head is at the deepest point as you bend forward to setup. With that said, I own and Nordkapp LV and I love it despite its high aft deck. Layback rolls aren't the most fun but forward finishing rolls are a breeze. Besides, I bought this particularly kayak because of its paddling characteristics rather than its rolling characteristics (still a good rolling boat). Good luck on your decision!